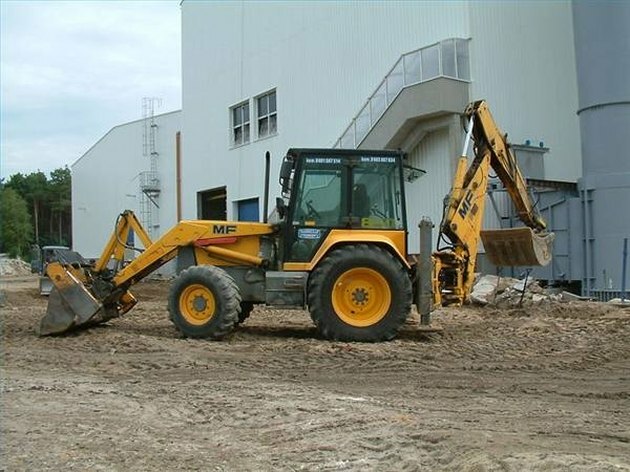 A backhoe also sometimes called a backhoe loader, is used for construction jobs, tearing down small buildings, transporting building materials, landscaping, and paving projects. A backhoe is actually a tractor that has been fitted with a bucket (or shovel) on the front and a backhoe on the back. Running a backhoe isn't particularly difficult. It is imperative to follow safety precautions, and to learn to operate one from someone with actual backhoe operating experience. Backhoes are integral parts of the contruction process. Mount the backhoe and fasten your seat belt. Be sure that the break is on. Shift the transmission to neutral. Turn the ignition and start the backhoe. Allow the backhoe to warm up for about ten minutes. When you are ready to dig, engage the lever that drops the backhoe. The piece between the tractor and the backhoe is called the boom. The piece between the boom and the bucket on the opposite end is called the dipper stick. Reverse the process to pick up the load you have just dug. Balance the backhoe carefully by turning the loaded shovel toward the back of the machine. Keeping it on one side or the other creates the risk of the backhoe overturning. Adjust the lever to dump the load in its designated spot. Repeat the process as needed. Lower both the backhoe and the shovel bucket to the ground when you park the backhoe. Park on ground that is relatively level. Turn off the ignition.